The Panorama feature does not function on the models with when using a microSD/microSDHC card. To use the Panorama feature, use an OLYMPUS xD-Picture Card™. The maximum movie length is limited to 29-minutes per movie. FEATURES: Enables use a mico SD card as a xD picture card. This microSD to xD adapter will NOT FIT into standard xD card reader or devices due to the design. After taking picture and video, the file can be download from the microSD card to PC with microSDHC card reader, or SDHC card reader (when use with SD adapter). 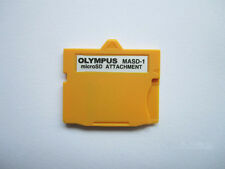 MASD-1 adapter can not open the panorama function,To use the Panorama feature, use an Olympus xD-Picture card. 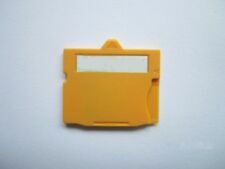 or remove the TF card into the MicroSD adapter and read it by general card reader. 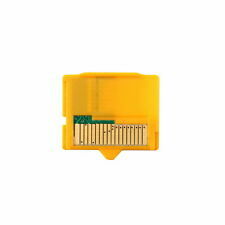 Support Micro SD CARD. (2) μ 1030SW / Stylus 1030SW. Stylus 1020. μ 1010 / Stylus 1010. μ 850SW / Stylus 850SW. μ 840 / Stylus. 1 x Card Adapter. 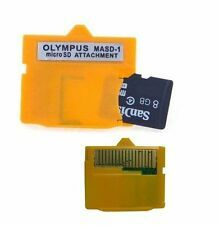 1 X Olympus MASD-1 Micro sd/ TF to XD Card adapter. 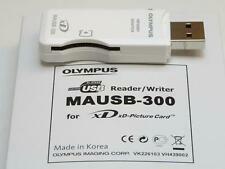 MASD-1 adapter can not read by the general card reader need to use the panorama feature use an Olympus XD card picture. adapter can not read by general card reader use USB Data cable to read the photo or remove the micro sd TF card to micro sd card reader or adapter. Card features 512mb of storage space. XDm-1GB-OLYMPUS Picture Card. If the exact item is not available, we will substitute the item with a similar item of equal or greater value. Card features 256mb of storage space. LOT OF 2 OLYMPUS XD PICTURE CARDS, 1-M1GB AND 1-M 256M, CARDS ARE IN GREAT COND. 1-M 256MB, THESE CARDS ARE IN GREAT CONDITION. Card features 1GB of storage space. Functionally it is in perfect working order. UG "Ugly" Very rough looking. EX "Excellent Plus" Exceptionally nice. May have slight wear on finish but visible only. Picture Card. If the exact item is not available, we will substitute the item with a similar item of equal or greater value. Original FUJIFILM 16MB XD Picture Card. Original fujifilm 16MB XD Picture Card Type H X 1. Card features 16mb of storage space. 32mb xD-32mb-fujifilm. Fujifilm XD 32 mb Picture Card. Original FUJIFILM 32MB XD Picture Card. Original fujifilm 32MB XD Picture Card X 1. Card features 32mb of storage space. Materials:Electronic components. Fujifilm XD 128mb Picture Card. 128mb xD-128mb. (Transparent Simply Glass Oil Pipe Universal 10CM Length Tube UU. 2) μ 1030SW / Stylus 1030SW. Stylus 1020. μ 1010 / Stylus 1010. μ 850SW / Stylus 850SW. μ 840 / Stylus. 1 x Card Adapter. Installation Internal. Product colour: Black, LED indicators: Activity,Power. Part Number: Manhattan 101998. Manhattan card reader USB 2.0 Black Multi-Card Reader/Writer Manhattan 101998. We are the Hi-Tech Lovers. Hope you will appreciate our seriousness and reliability. Enables use a mico SD card as a xD picture card. This microSD to xD adapter will NOT FIT into standard xD card reader or devices due to the design. After taking picture and video, the file can be download from the microSD card to PC with microSDHC card reader, or SDHC card reader (when use with SD adapter). 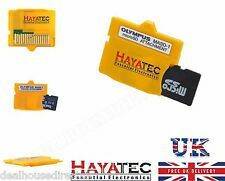 MASD-1 adapter can not open the panorama function,To use the Panorama feature, use an Olympus xD-Picture card. 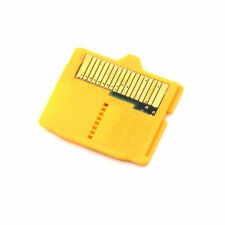 Support Micro SD CARD.